Suppose you design a garment, come up with a good idea for a TV show or have written a book. Is it protected by copyright? According to the Dutch Copyright Act, the item or idea must constitute a ‘work’. There is no actual definition of ‘work’ in the Copyright Act, so where can you find an explanation of what exactly constitutes a ‘work’? Furthermore, are there any requirements your work must meet in order to be protected by copyright? The Dutch Copyright Act does not provide an explanation of what exactly constitutes a ‘work’. It does provide a few examples of types of work which are eligible for copyright protection, including (but not limited to) books, films and stage plays. Case law presents us with three requirements a work must meet in order to be considered copyright-protected. These requirements are as follows: the work must be original, it must be able to be perceived by our senses, and its design must not merely serve to achieve a technical effect.. The first requirement a work must meet in order to be copyright-protected is that it is original. This means that your work cannot be too similar to other, existing works. What matters is that the work must have a clearly discernible ‘personal touch’ added by its creator. 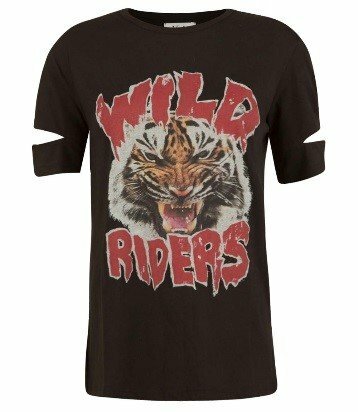 For instance, a basic short-sleeved black T-shirt will not be copyright-protected, because it is too basic to be sufficiently distinct from other short-sleeved black T-shirts. The more choices made in the creation of the work, the more original the work. Take, for instance, this black T-shirt by Zoe Karssen, which became an original work because she printed an image on it and added some detail to the sleeves. The second requirement a work must meet is that it is perceptible by our senses. This means that the work must be able to be seen, heard, felt or read. For instance, if you think up a story, you will have to make it perceptible by the senses. You can do so by writing it down, reading it out loud or even by typing it in braille. Last but not least, there is a third requirement, which is that the design must not only take into account the technical results that can be achieved through it. For example, consider a corkscrew. The spiral that is part of a corkscrew is required to make the tool effective. The spiral is merely there to achieve a technical effect, and so is not copyright-protected. 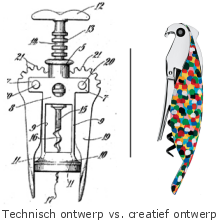 What can be copyright-protected is the design of the part of the corkscrew that is not designed to serve a technical effect. For example, see the corkscrew on the right. Technological discoveries can be protected under patent law. So you have created a work. Now what? If you meet all three requirements outlined above, you have created a work that is protected by copyright. However, it is important that you can prove that you were the creator of said work. Your CC Proof account allows you to record works without limitation. By doing so, you will give the work you have uploaded an official date of birth, which will help you demonstrate that you were the first person to have this work, which in turn will make it very likely that you were indeed its creator. Sign up here and give your work an official date of birth!